We are thinking about putting in a fruit display garden/orchard here at the Extension Office. It’s not a sure thing whether or not we’re going to do it. We are just in the exploration and pre-planning stages. One of the reasons for growing fruit in a small home garden that we discussed during Master Gardener class last week is that you can grow fruits that are unusual or not easy to find in the grocery store. 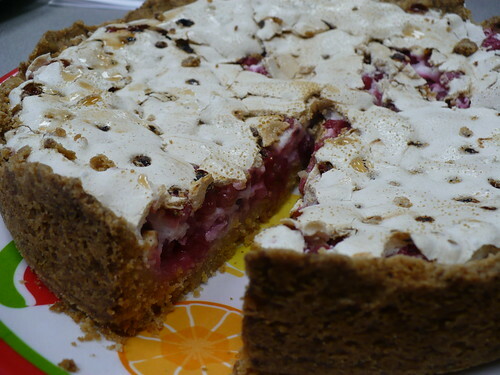 Of course, I had to bribe everyone to see my point of view by feeding them – Red Currant Scones and this yummy Red Currant Pie. I had frozen 4 cups of currants back in June when the single Red Currant bush in the Demo Garden was loaded. When’s the last time you saw fresh (or even frozen) red currants in a grocery store in Kansas? That’s right…pretty much never! So, that being said, which fruit would you like to see planted in a fruit display garden? Posted on October 13, 2010, in Around the Garden, Polls and tagged berries, fruit. Bookmark the permalink. 1 Comment. Well, you know we’d love to have an orchard in Delano. I don’t know of a specific good location off the top of my head, but we could come up with something. And on an unrelated note: who at the Extension would I talk to for information on requirements for a community kitchen? Ideally, a food business incubator type, a place for folks to pickle and make salsa and stuff to sell at market, and so on.